Looking for a wacky place to stay for the evening? If you're looking for romance it could be found at the Regent Beverly Wilshire (Pretty Woman), or are you looking for something more edgier? The Hotel Mon Signor (Four Rooms) may have some vacancy's, I know theres always room at the Bates Motel, but I wouldn't advise staying there! The Overlook Hotel is quite beautiful if the phrase "All work and no play…" applies. If you're looking for something less colorful there's the "Grand Hotel" and you're a bit more animated, you can always stay at Hotel Transylvania! Now last year I visited the Best Marigold Hotel, which was quite entertaining, but this time I was yearning for something a little more eclectic, artistic and a bit wacky. So I checked into "The Grand Budapest Hotel" It's a bit out of the way considering it's on the farthest eastern boundary of the European continent, but that just adds to its charm! Currently, upon arriving, you may happen to bump into a young writer, played by Jude Law, who could tell you all about his journey into the history of "The Grand Budapest Hotel" and the man that served as their legendary concierge. As the story goes, Gustave, played by Ralph Fiennes, is not only running the hotel, he is also taking care of the many elderly female hotel guest, making their say very…satisfying. One of which is Mademe D, played by Tilda Swinton, who Gustave is quite fond of. Madame D seems to be quite disturbed having ideas that this may be the last time she sees her Gustave and after she leaves Gustave finds that her premonitions were correct. Madame D has passed under mysterious circumstances. Upon receiving the news, Gustave and his newly interviewed Bell Boy Zero head off to pay their respects. They arrive at the reading of Madame D's will to find almost every possible person she's known has come to see if she has left them something as well. Gustave finds out that he was left "Boy with Apple" a painting worth quite a bit of money. Before leaving with the painting, Serge X hides a confidential document inside the frame of the painting. Gustave and His Bell Boy return back to the Hotel to find Henkles, a police officer played by Edward Norton, is there to arrest Gustave for the murder of Madame D. Gustave now has to find a way to prove his innocence. While Gustave may be running the hotel, the man running the whole story is none other than director Wes Anderson. Anderson has had multiple Academy awards nominations for his other films such as "Moonrise Kingdom" (2012), "Fantastic Mr. Fox" (2009) and "The Royal Tennebaums" (2001) and is known for his innovative film-making style. His films are quite colorful in costume and design, always on the edge of looking like a pop-up book you had in your childhood. In "Budapest" Anderson shot the film in 1.37, 1.85 and 2.35:1 formats to inform the viewer where they are in the timeline, which alternates between three time periods: 1985, 1968 and the 1930s. Besides the stylistic vision put to film, Wes Anderson films are also known for their casts. It's as if Wes declares "Round up the usual suspects" and they all come back for another class reunion in filmmaking. Bill Murray leads this group with 7 Anderson films, Owen Wilson (6), Jason Schwartzman (5), Adrien Brody & Willem Dafoe (3), Tilda Dwinton, Jeff Goldblum & Edward Norton with 2 films under their belts. "Budapest Also adds to the cast Ralph Fiennes, F. Murray Abraham, Harvey Keitel, Jude Law, Saoirse Ronan and Tom Wilkinson. Wes Anderson has his own personal style when introducing his characters through out his films and not knowing who's going to show up next, gives the audience little surprises around every corner. 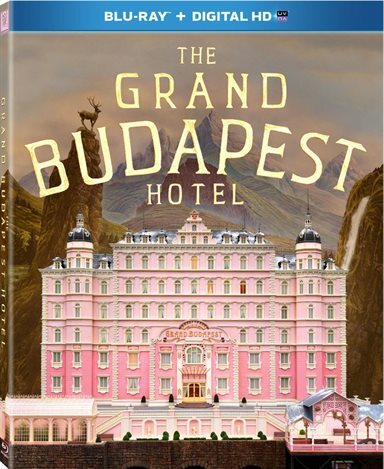 In this Blu-Ray + Digital HD release of "The Grand Budapest Hotel" there is a few extras including a Vignette on The Society of the Crossed Keys, and Featurettes on "The Making of The Grand Budapest Hotel, Cast & Wes Anderson. Also is a still gallery and a cool piece with Bill Murray touring the town in which it was filmed. One of the cool things in these behind the scenes is Bill Murray talking about how Wes Anderson brings his cast together almost like a college dorm, all eating together and working together which you don't hear often when it comes to film making projects. The Grand Budapest Hotel is a fun, entertaining and a visually stunning film that completely represents Anderson's personal style. "Budapest" is like watching an Agatha Christie story mixed with a touch of the three stooges and a bit of English dry humor. Rich in design, witty, and well worth checking into for a short stay, even if its only 100 minutes! I give it 4 tasty Mendels Cakes out of 5! A colorful tasty treat for dessert!. Download The Grand Budapest Hotel from the iTunes Store in Digial HD. For more information about The Grand Budapest Hotel visit the FlickDirect Movie Database.